The Formax OnSite FD 8652CC AutoOiler Shredder features fully-automatic internal oiler that periodically pumps oil onto the cutting blades for optimal performance. 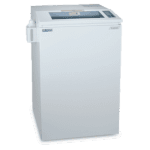 The FD 8650CC is an office-size shredder with industrial strength, and shreds up to 32 sheets at one time at speeds up to 33 feet per minute. The extra wide feed opening handles documents up to 16” wide and the large waste bin holds up to 53 gallons. These specifications make it an ideal centralized office shredder. In addition, the ECO Mode saves energy by automatically switching into standby mode after 5 minutes of inactivity. 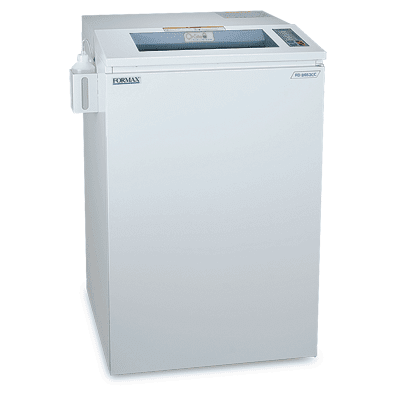 Commercial-grade features include an easy-to-use LED control panel with load indicator, heat-treated steel blades, a steel cabinet, lifetime guaranteed waste bin, and a powerful AC geared-motor ensuring years of reliable performance and information security in your office environment. Key FeaturesAutoStart/AutoStop. LED Control Panel. Cross-Cut or Strip-Cut. 16" feed opening. Energy-saving ECO Mode. All-metal cabinet. Oiling system.